Hello everyone! Pinurabi here, writing to report that the European media interviews have come to an end. 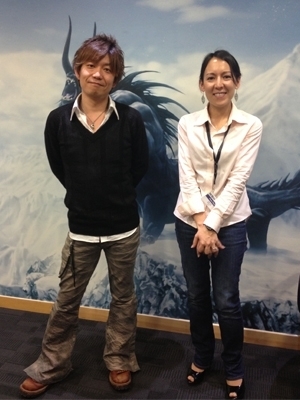 Below is Yoshi-P with our indefatigable interpreter for the entire tour, SEE?s Saori Hill. Yoshi-P is a man with a lot to say, and it?s no ordinary interpreter who can keep up with his endless stream. But keep up Saori did, across an eclectic range of subject matters. Hats off to her! 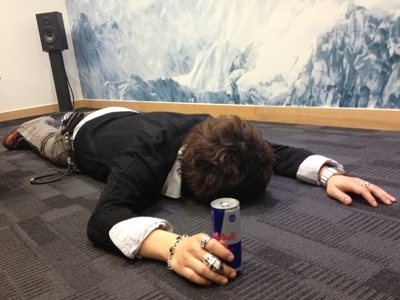 Sustained by two cans of Red Bull and double that amount in coffee, Yoshi-P powered through the final day of the tour. Here?s a photo of the man lying prone and senseless, utterly spent of all info?info which will soon find its way to our fans. Brace yourselves for a veritable flood! The media tour may have wound down, but our work here in London isn?t over just yet. There?s another meeting tomorrow morning before we fly back to Japan, and to our beloved development floor. Have at me, Japanese text! Cue the FFXI death music for the planking photo. I'm sure he is tired. I wish I had his work ethic. A little birdy told me sometime between now and then... sadly then is being kep tightly under wraps... Luckily a cat jumped up and caught the birdy, and in his death throes I heard something that sounded like "before you can finish a carton of cigarrettes"... unfortunately that too is vague, seing as how some people can survive on a single pack for a week, and others burn through multiples in a day... So the question really is... how long does a carton last Yoshi P? He can't be that tired. Getting down on the floor knowing you're going to get right back up again takes a lot of energy. I want Red Bull to be a usable item in the game as an homage to this. A player character chugs it, briefly gets a pair of ghostly wings, and has their Rested state recharged for a few thousand more exp. Well, with the way in-game advertising is going, this could be a thing. I am not a consumer of energy drinks or coffee but if I were I'd imagine I'd be something like Hammy in Over the Hedge. Now that would be a pretty over the top food bonus/effect.